In the past, I always had pretty good skin, but I hit a rough patch my sophomore/junior year. No one really knew because I did makeup, and to be honest, I did it well. I could cover it up great. Especially since my pimples were pretty flat and like scars. I felt so insecure, and could never go to school without makeup. I feel like everyone goes through a part of their life when their skin is rough or it makes them feel insecure in some way. It's crazy how much it can affect your confidence! I've tried a lot of different face washes and creams (and even birth control) and nothing worked. When I went to college my freshman year, I got a rash on my chin that was a form of rosacea. I went to the dermatologist, and they prescribed me clindamycin (anti-bacterial cream) and doxycycline (anti-bacterial pill). Thank god for that UGLY RASH!!! These things made my skin so much better. After my hormones leveled out, my skin improved, and I realized that the more products on my skin was not better. 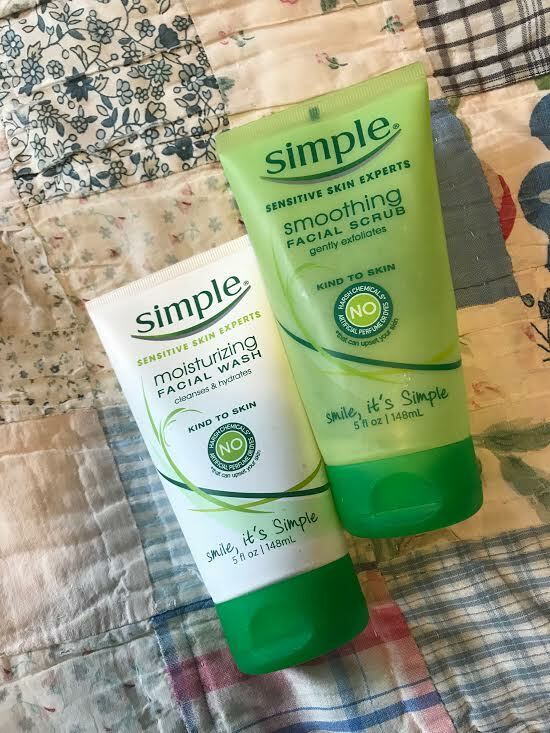 My family always had "Simple" face wash in our shower and I decided to use it (the name sounded like what I needed). I used it morning and night with lightweight face moisturizer (no scents), and used the Simple exfoliant 1X-2X a week. My skin looked so much better. My acne scars started to fade and I am so thankful that I used something "simple" and with less ingredients/less harsh. This face wash has vitamins and it doesn't dry out your face. It's super moisturizing! So, for those who struggle, stop putting so much crap on your face! And wait it out if you are in a hormonal time of life. Also, if you are past that, go to your dermatologist and figure out a plan. I know that skin can attack self-confidence, and it's okay to make steps to be the best, most confident you!